This view is very important for many business applications. There can be several ways of implementing this view, depending upon your specific need you can write one. I will discuss the simplest one in which I will be creating a dictionary to access names. I will be adding code to same DatabaseTest project which I created earlier. You will notice that I have commented tableData and declared an additional array and a dictionary. We wont be using tableData anymore instead data will be now stored in dictionary objectsForCharacters. You will understand how in some time now. I will explain what we are doing here. For each alphabetical character we are querying database to get all the names starting with that character. If we get 1 more or more names for a character, we add that character in an array arrayOfCharacters. Names are stored in a separate array arrayOfNames. This is a temporary array which will added to dictionary objectsForCharacters. At the end we have arrayOfCharacters holding all those characters which have at least one name starting with them respctively and we have objectsForCharacters holding an array of names for each character in arrayOfCharacters. The first method asks for an array of strings which it will use as index titles. You can find indexes A-Z vertically arranged on the rightmost side of tableView. Here you can decide either to give all the characters or just the ones in arrayOfCharacters. In the second method you specify what should be the section number for the given index title. In third method you provide the title for each section header. 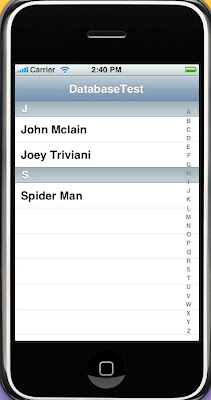 You can find in the first figure, a gray bar with a character appearing in it just above each section. I think I have already explained the code. Here we have first derived the character for the section. Then we used that character to obtain its corresponding array of names. And the count of names in the array will be numberOfRows in that section. Go ahead and run the project and you should see the screen similar to figure 1. Also try adding more data into database and see how it looks. How to I make it so the user can add there own contact? Not just for contacts. Normally in business applications, you need such screens for showing contacts, leads or anything that is to be searched by its name. Your code syntax coloring is great, but look terrible over the Black background that you have for your blog. Perhaps a lighter backgroung would do well. can I make the indexes appearing in the right most bar clickable? such that when I click on one index item/character, it gets me all the matching records for that character. I got it to run but when I press/select a letter from the alphabets index values (on the rightSide of the TableView), it displays the letter at the top of the device, but does not go to those words. What did I miss? Hi, I have an image in my SQLite table for each record which I would like to display on the left of the row content. How would I change the code for this to happen. Thamks for sharing such a helpfull code.